I often make cuttings from my existing herb plants such as basil and mint to prolong and increase harvesting. I will place the cuttings in old jars (especially those which labels can never be taken off) filled with water till they root and can be put into soil. However some cuttings can be rather short and the leaves may fall below water surface and they will start to rot. So I put each cutting through the hole of the old CD/DVD, then place over the jar. This way the leaves can stay dry whilst the cuttings stay safe in the water. I have done this so many times, my very first basil plant is still alive since 2008. Wow!! 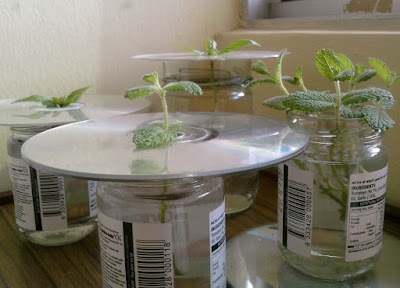 I was searching for some ways to make use of old CDs. Very interesting work going on here.. This is a good tip! !